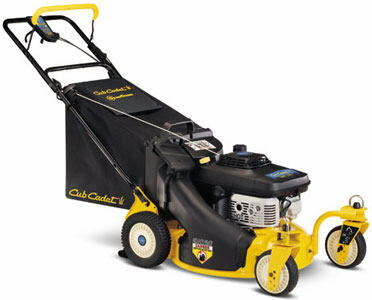 Cub Cadet SRC621 I bought the Cub Cadet about 4 years ago at a Lowes store. The reason I bought this mower over all the other models is the ability to raise and lower the deck. This is in my opinion the best feature of the mower. With the Cub Cadet it is extremely easy as there is a single handle on the side of the deck that raises all four wheels at one time. This is very handy for me since my front yard is deeper than the back yard and I need to adjust the wheels with every mowing. The second best feature is its ability to start on the first pull. You prime it 3 times and pull once. It is very easy. The third feature that I like is the ability to quickly change from bagging to chute to mulch. Cub Cadet provides 3 different covers for the deck and they are all easy and quick to change out. Of course with every product there are some downsides and the Cub Cadet has a few of those as well. First, the self propelled feature has 5 speeds but only 1 of them really works. The other 4 speeds just dont have the power to pull the mower through the yard. About a year after I purchased the machine the steel self propelled cable connecting the handle to the machine broke apart. It was difficult finding the part and I had to travel to another city to get a replacement. The spacer on the mower driveshaft that the blade is attached to is cracked and the wheel covers will not stay on. Overall I think this is a good mower and I would consider purchasing another should I need to buy a new one. Cut my smallish yard for 13 years without anything but oil changes. Finally it has developed a sudden problem of oil in the cylinder and will not start. It has plenty of compression so I'm not yet sure if it's a blown head gasket (some internet reports of blown head gaskets on these engines leading to oil in the cylinder), or if there's some other explanation. Not sure if I'm going to try to repair it, or get a new/different mower. It's extremely heavy, but much better built than most of the throw-away crap you can buy these days for less than $450 or so. Warmed up it is a non starter! I bought mine also at Lowes and they no longer carry it. The wheel height adjustment is a pain and only changes by one inch increments. I have replaced the wheels and had multiple repairs on the engine. The biggest nuisance is the engine. It starts fiirst time when it is cold but is a devil to start after the first bag is dumped. I have tried everything to nurse it alive and it takes many pulls to do it. Today it starts and runs for 10 seconds and then dies it is now close to the graveyard. The rpair bills tell me I should not repair it further. My lawn is half mowed and the mower is in orbit so you might see it. Tomorrow I will buy a new different mower. I see an inventory of these engines on line for a bargain. That probably says it all. Cub cadet's mower was an excellent product when it worked for a few years until the day it died on me. The Kawasaki engine's head gasket failed. I had to order a replaement engine gasket, which they made it thicker than the original. The trouble with engine only after about 4 years of use is not acceptable. BTW, my father owned an exactly same model, maybe one or two years older than mine. Its engine developed a same condition. Once I found a repair manual online, I spent about 1 hour to fix it. Comparing B&S engine, I think it was Kawasaki's design problem. It needs a head bolt in the middle where the gasket blew. Google the problem and you will see. I have owned this mower for 6 years. It is not user friendly to raise and lower the deck. Each wheel must be addressed seperately, and takes some time. The wing nuts plastic, and I have replaced several. Plastic wheels. Only bag, or mulch. Straight chute not an option. Best part is the Kawasaki engine. Starts on first pull. I don't use it anymore. First of all the height adjustment doesn't raise all four wheels. As you can easily see in the picture the front wheels have a bolt and plastic nut on each wheel that has to be changed manually. Most of the nuts on this mower are plastic and will eventually be lost in your yard so be prepared to replace them. I have had mine for approx 5 years and I would definitely not buy this mower again.